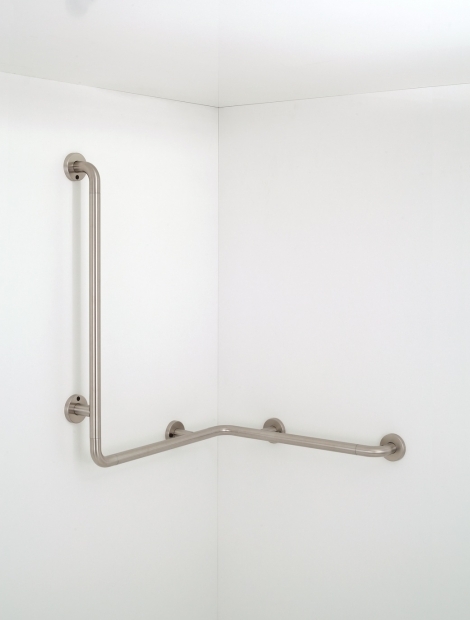 Corner shower rail with shower head rail made of tube, bends and supports are stainless steel AISI 316L diam.32 mm. Horizontal lenght 760 (800*) mm x 760 (800*) mm, vertical lenght 1160 (1240*) mm (* max outer dimensions). The fixing to wall is made through nylon roses with metal core and cover in stainless steel AISI 316L. Possibility to mounting the shower head holder. Available in left or right handed version. Fixing set as free outfit for concrete, natural stone, solid brick. It does not need grounding.